While I still would cling to the old original designs I always did like that that "rising sun" bandanna/mask. Yeah Don had it when they would wrestle. 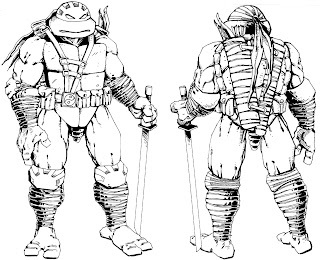 I really love these designs, I'm totally up for the turtles changing outfits from time to time. Out of all the variants we've seen over the years in the toy lines I think these concepts of yours would be amazing and would get allot of attention. I kind of like the design changes. It shows the characters have evolved a bit beyond the standard costume. Truth be told, way back in 1995 and the original series 9th season...the new Mutations where the only things keeping me tuned in. Carter was boring as hell, Dregg just seemed like they where trying to cash in on the Power Ranger craze with cheap looking alien villains. And the writing went from Bad to un-watchable. I'm curious if there where ever any design ideas done to show what Splinter would have looked like had he mutated with the guys. It was hinted at, but never shown. Hah that's Funny you bring up Lord Dregg Neil, I really liked him souly on the fact that he was voiced by the late great Tony Jay. Not only that but his side kick Mung still remains one of my all time favorite TMNT side kicks, I mean come on the guy looks like a Muppet. Oh I agree. Tony Jay was the ONLY good part of Dregg in his first season. The second season made Dregg a much more fun villain, as they practically drove him insane :). Is it possible the Ninja Turles would get to wear actual ninja outfits, even if it's just as variants in the toyline? -->> ..my favourite outfit ..
Any truth to the rumors going around back then that the fourth movie was supposed to feature a live action Dimension X and Krang? Out of all the fourth movie talk, I remember that the most..."